Michael Rotondo: Is he just the quintessential millennial deadbeat? Pictured, Camillus, NY man, Michael Rotondo during Tuesday’s court proceedings. ABC7 Screenshot. Deadbeat son of the year? Michael Rotondo a Camillus, NY man has told of planning to appeal a judge’s decision to hav him evicted after his parents took their unemployed son to court demanding their ‘deadbeat’ son move out. A 30 year old unemployed son has been ordered by a NY judge to move out of his parents home after the couple tried and failed to get their ‘deadbeat’ son to leave, forcing them in a last ditch effort to take their very own son to court. 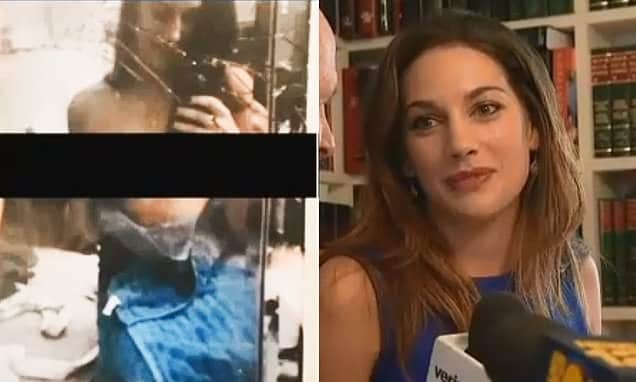 Appearing at a Tuesday morning hearing which media reports told of lasting 30 minutes was 30 year old man, Michael Rotondo and his parents, Mark and Christina Rotondo of Camillus, New York. During proceedings the parents told of trying for months to evict their son after the unemployed man refused to pay rent or contribute in any way around the house. Upon hearing the parent’s case, NY State Supreme Court Judge Donald Greenwood sided with the parents ordering the son to move out. When and how soon remains a mystery (more on that below…). Appearing in court, CNY Central reported the son arguing that legal precedent allowed him six months notice before his parents could kick him out. 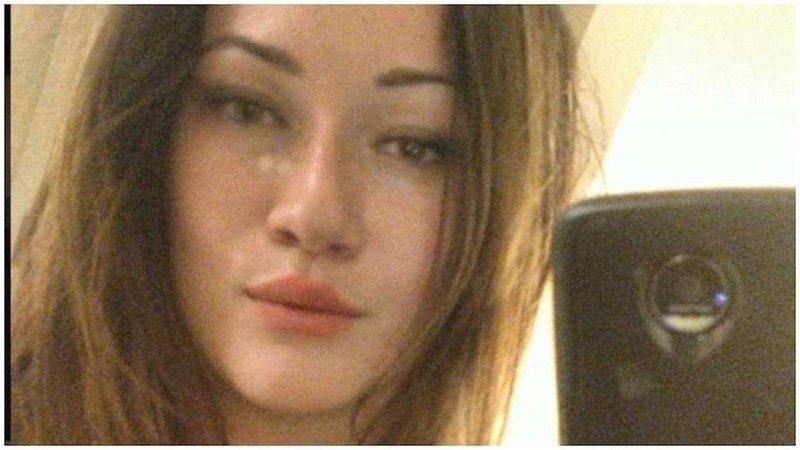 The judge pointed out another case that nullified that previous decision, and called six months an ‘outrageous’ amount of time to ask for. Michael responded that it was ‘outrageous’ to evict him. Upon being ordered to vacate his family’s home the ‘frustrated’ son claimed he didn’t think the judge read the case fully. Rotondo said he planned to appeal the decision. 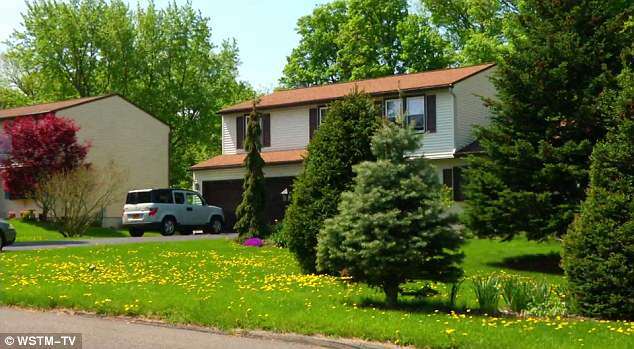 Pictured the Camillus, NY home of Michael Rotondo’s parents the son had refused to leave. Michael Rotondo, ‘I am so outraged!’– But should he be? 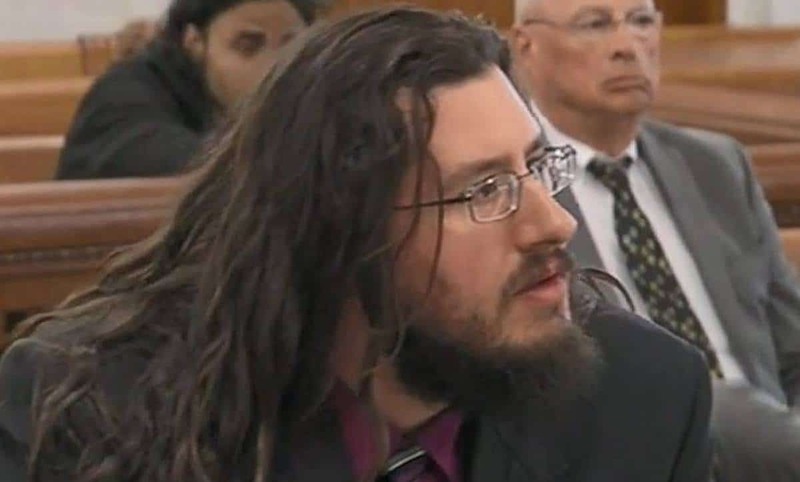 ‘I am just so outraged,’ Rotondo told via the dailymail outside of court on Tuesday, adding that he has been taunted by conservative groups for being a ‘liberal millennial’. He also said his parents don’t provide food or did his laundry for him. During proceedings, the judge tried to convince the son to come to an agreement with his parents on his own, but when Rotondo refused, the son was ordered out of the house. 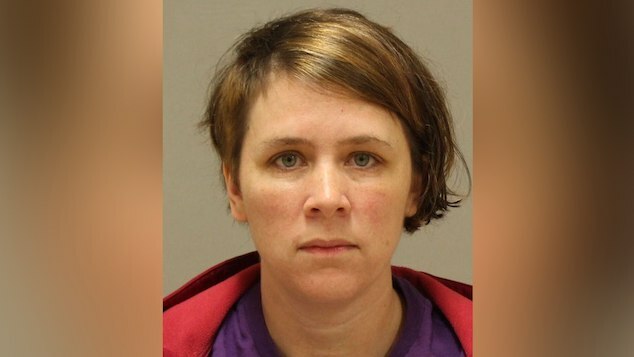 Egging matters, the judge also ordered adult protective services to investigate. Greenwood asked the couple to come up with an eviction order that he would sign. It was not decided in court on Tuesday how long Michael would be given to move out. But since he plans to appeal, he’ll likely be able to stay in the home until the appeal is decided anyway. The couple’s lawyer said he’d like to get an eviction notice that would be enforceable by the sheriff. Of question is whether the Rotondo has ever lived outside of his parent’s home. Public records connect him to two other Syracuse-area homes, where he is said to have lived between 2008 and 2010, when he would have been 21 to 23 years old. His parents home is owned by his mother, who bought it in 1988. The four-bedroom home is worth an estimated $218,000 according to Zillow. 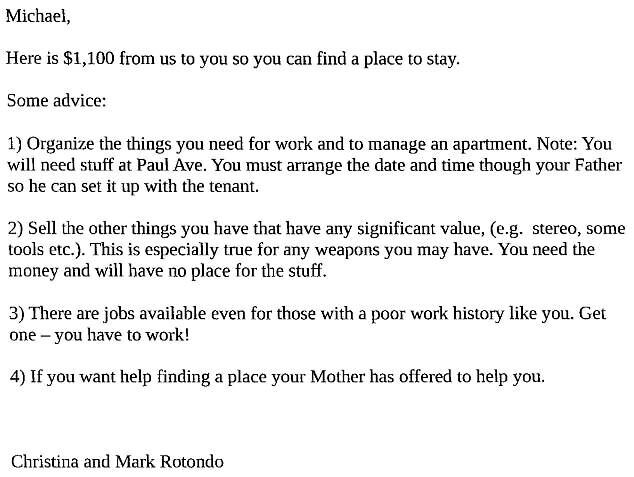 One of the five letters Michael Rotondo’s parents served their son in a bid to get the man to move out. Michael Rotondo, the bane of his parent’s existence or just trying to get a leg up in a moribund economy? Michael Rotondo refused to take a hint: Become your own adult! 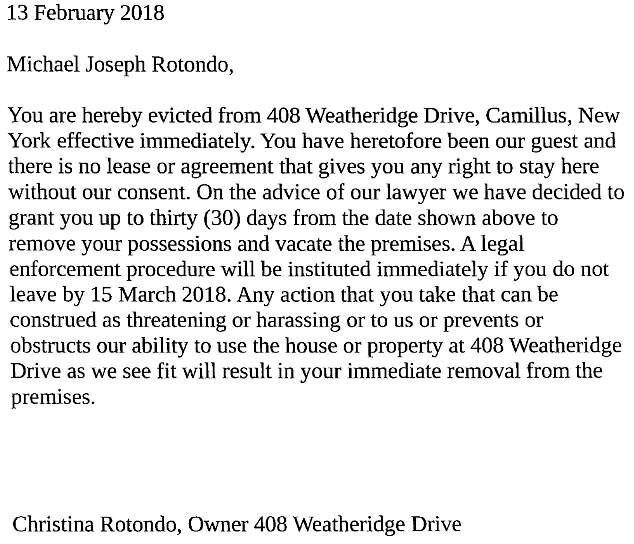 Over the past three months, the Rotondos have given their son five written notices to move out, only for the son to ignore his parent’s pleas each time. They initially tried to get him evicted, but learned that since he is a family member, he would have to be removed from their home through an ejectment proceeding. In a response to his parents’ court filings, Michael – who turns 31 in July and is acting as his own lawyer – says his parents have not given him a reason why he is being kicked out, or enough time to find a new place. He claims in his response that in the eight years he has lived with his parents, he ‘has never been expected to contribute to household expenses, or assisted with chores and the maintenance of the premises, and claims that this is simply a component of his living agreement’. Rotondo also cited a court precedent which says that he needs six months notice to be kicked out through an ejectment action. In a redacted filing, Michael also said he runs his own ‘successful’ business, calling it ‘the overwhelmingly superior choice for the economic well being over the working of a full-time job’. Wrote Rotondo’s parents in one of the letters they served their son, ‘There are jobs available even for those with a poor work history like you. Get one– you have to work! 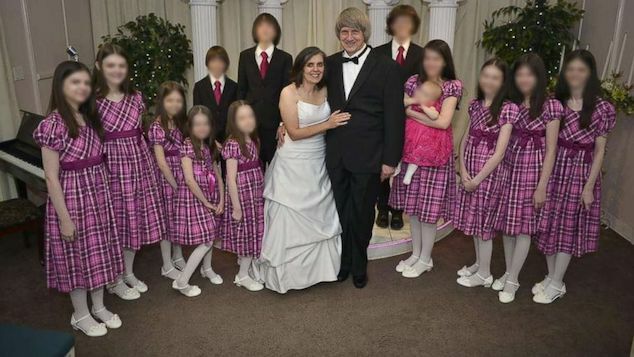 Their most recent letter Rotondo’s parents served their son was written on March 30, concerning their son’s car, offering him money to fix it so that it can be taken off their property. ‘I feel bad for both of them, because he’s not learning anything by staying at home and he’s just wasting their time and money,’ one neighbor told via WRAL. Michael appears to be no stranger of the civil court system. Last year, he filed a lawsuit against a local Best Buy for discrimination, saying he was fired because he couldn’t work Saturdays due to a court visitation schedule. In that case Rotondo is seeking nearly $340,000 in damages, pay and attorney’s fees from the store outlet. In a separate case, Rotondo claimed his rights to due process were violated in family court, but that case was thrown out in November of last year. Deadbeat son sued by parents has one week to move out says court. And then there were these remarks on the web that caught this author’s attention. See what you think?